The University Police Department will release videos featuring students for a digital safety campaign. The University Police Department will kick off a revamped digital safety strategy next month with videos featuring students acting out safety scenarios on campus. UPD Chief RaShall Brackney said in an email that the videos — which will demonstrate safety tips for residence halls, theft prevention and crossing the street — is a continuation of the social media strategy she introduced when she came to campus last year. The department will focus on a digital strategy that enables students to reflect on their safety habits, she said. The videos will be on social media because it is where “community members are already actively engaged,” Brackney said. They will also be posted on the UPD website. “We hope that by watching these videos, students, as well as faculty and staff, will take a moment to think about their own personal safety,” Brackney said. UPD sought student volunteers for the videos in July by advertising the digital safety campaign on Facebook and Twitter. Brackney said the casting call from the summer helped the department find students to star in the videos and serve as extras. She added that the department will have casting calls throughout the year for future videos. “To make the videos more engaging, we sought to involve students as well as GWPD officers that you might see every day on campus heading to class or work,” she said. She said the strategy is a continuation of other outreach efforts she started last year, including Coffee with a Cop meetings, during which Brackney held office hours at different locations on campus. Brackney spoke with students and community members at four different events last academic year to establish relationships with people in the community and better understand safety concerns on campus, she said. Brackney also launched a new social media strategy last year using the hashtag #GWSafety to aggregate campus-specific safety tips. UPD posted a humorous safety video in 2013 on the department’s Facebook page, which included students and actors demonstrating how crimes can happen on campus and explained good safety habits in places like South Hall and Gelman Library. John DiFava, the chief of police at Massachusetts Institute of Technology’s campus police department, said departments should share safety information in as many ways as possible. Engaging students on social media is a good idea because students already spend time online, he said. “The more avenues and resources that you incorporate ultimately results in more people hearing and knowing what you’re trying to do,” DiFava said. He added that schools located on city campuses have different safety concerns than those on traditional college campuses. Safety messages from the campus police departments should fit the college’s urban environment, he said. “Your messages have to be custom-tailored to the venue that you’re in,” DiFava said. James Clark, a managing partner of Clark Security Group, a campus security consultant and an expert on security policies and procedures, said that police have to find the right balance of information to give busy students without bombarding them. A campus department using real students and actors in social media outreach is an “effective way to develop positive relationships and impactful communications” with the department, he said. “I am always pleased to see campus safety forces who utilize all available means to connect with their constituency, especially students,” Clark said. 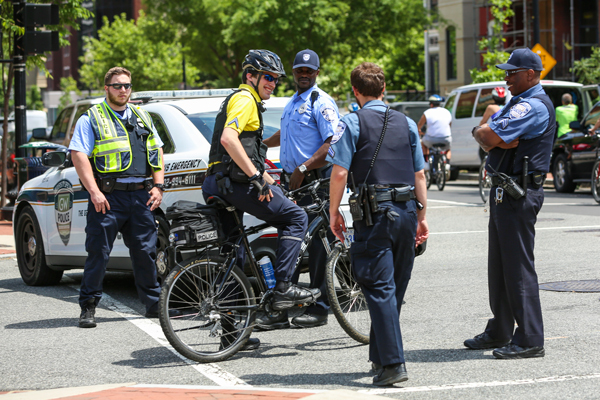 At least three of GW’s 14 peer schools have safety videos posted on the campus police departments’ websites or on social media pages. The University of Southern California has a safety video for students on its safety department’s website, featuring students, administrators and campus safety staff. The USC video addresses other topics besides theft prevention to cover topics like alcohol safety, sexual assault prevention and a dramatization of how the campus’s blue light system works. This article appeared in the August 29, 2016 issue of the Hatchet.